How to play volleyball section covers the very basics of volleyball skills - setting, passing, spiking, serving, etc. We also explain some very basic rules of volleyball. In this section we help beginning volleyball players to learn the most important aspects of each skill. If you are looking for more detailed information, like the various volleyball passing techniques in the pictures below, you find them in the volleyball skills section. Various serve receive techniques: high passing position on the left, low passing position in the middle and "knee on the ground" technique on the right. Go to volleyball skills section to find more information about basic volleyball techniques. We go through some very simple rules of volleyball. If you are looking for more detailed information, go to the basic volleyball rules pages. 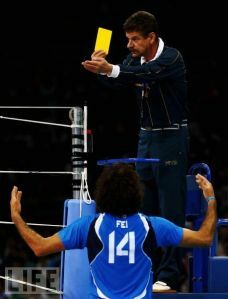 What is Yellow Card in Volleyball? An indoor volleyball match is usually played with “the best out of five games” – system, which means who wins three games first is the winner of the game. On junior level games can be also “the best out of three”, which means you have to win two games to win the match. Volleyball Game is played until 25 points, usually – some leagues may use 30 point games to determine the winner. The deciding game, the fifth game (or the third game in the shorter match) is played until 15 points. “Two point difference” is required for the winning team to end the game – which means the game can continue longer than 15, 25 or 30 points. The team which gains two point lead after 15, 25 or 30 points wins the game. In other words the game can end 26-24 or 27-25 or 16-14 or 17-15 – it is not possible to end 25-24 or 15-14. How to Play Volleyball - How to Get a Point in Volleyball? Team who wins the rally will score a point. Each rally begins with a serve - and ends when either team wins the rally. Team can score a point after the own serve - or the opponent's serve. Before the recent rule changes a team would score a point ONLY after own serve. Before the rule changes it was called a sideout when team won the rally after opponent’s serve. You still hear the term “sideout” in the volleyball courts. Volleyball team has 6 players on the court. Players rotate on the court after each “sideout” (when team wins ball after the opponent’s serve) – therefore new player goes to serve after each “sideout”. Three of the players are front row players. Other three players are back row players. 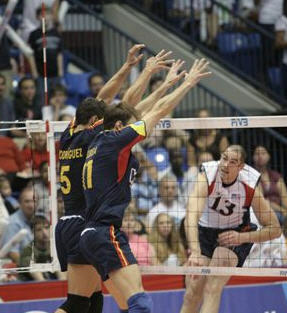 Back row players can not spike/attack or block the ball inside 10-foot or 3 meter line. Libero is a player who carries a different color jersey. Libero is a defensive specialist who enters the game without regular substitution. Libero goes into the back court to replace any player on the back court (usually libero replaces middle blocker/center). Libero is not allowed to serve in international volleyball. When libero enters or exits the court, it is not calculated as substitution. Maximum of 6 substitutions per game is allowed in international volleyball. Notice that some volleyball leagues in USA allow unlimited substitutions. How to score a point in Volleyball? Team scores a point after winning a rally. The rally starts with a volleyball serve. The player stands behind the backline and hits the ball over the net between the antennas. 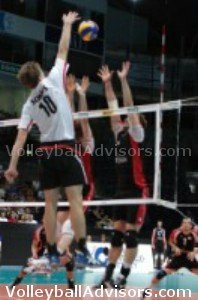 Volleyball Hits – How Many is Allowed? Volleyball Team has a maximum of 3 hits to play the ball into the other side of the net. A block doesn’t count a touch in indoor volleyball – therefore 3 hits are allowed after a block. How to Win a Rally? A player hits the ball into the opponent’s court (part of the ball has to touch painted lines or inside the painted lines). A player hits the ball off the opposing player. Opponent is not able to return the ball back into your side. Opponent hits the ball out of bounds. If the ball hits antenna it is called out of bounds. If the ball hits the ceiling it is called out of bounds in international volleyball. Some leagues allow play continue after ball hits the ceiling. If a player commits a fault or violation when playing the ball. To read more details about the faults and violations, go to basic volleyball rules pages. Volleyball Players moves around the court by shuffling. Shuffling means the player takes multiple tiny steps sideways, backward and forward – without crossing feet over. You Don't Have to Move in Volleyball?? WRONG! Have you ever heard somebody saying in school gym class “let’s play volleyball because you don’t have to move and sweat in it.”? It is a very common misconception about volleyball. It may be surprising that volleyball players can actually move a couple of miles distance during the match. To read more about shuffling, go into volleyball skills pages. The basic stance is also important for beginning volleyball players. When volleyball player takes a basic stance, feet are placed slightly wider than shoulders, the weight is forward on toes (not on the heels), knees are bent, arms are free (not attached to each others) in front of the body. How to Play Volleyball – What Volleyball Skills to Learn First? After shuffling and basic stance have been learned, players can move into learning technical skills with the ball. How to Serve in Volleyball? How to Play Volleyball - Underhand or Overhead Serve? Volleyball rally begins with a serve – underhand or overhead serve. It is recommeneded for the beginning volleyball players to start with the underhand serve. It is easier for the server - and more importantly it allows longer rallies in practice. Overhead serve can make serving and playing very difficult for the beginning volleyball players. The purpose of the serve is to give hard time to opponent’s offense, but when teaching beginning volleyball players it is not the best practice. Important Tips for Underhand Serve! The player has to toss the ball at least a little bit into air – it is not allowed to hold the ball in hand when hitting the serve. For the same reason in the very beginning players could consider tossing the ball over the net, instead of hitting the serve. In the very beginning phase younger volleyball players could be catching and tossing contacts when playing. For example the coach should enforce players to hit the ball over the net only after the third contact. The coach should move a step by steps toward real volleyball games. The next step is to allow catch and toss only with the first contact - and finally not to use catch and toss at all. Often when playing these games, the players want to try to swing the ball with the third contact. To make sure the rallies will be longer, the coach should allow only bumping and setting with the third contact until the spike and spike approach have been introduced. A soft landing for hitting is to allow only "spike approach + jump + tip" for the offensive player. After players get hang of the tipping the coach can allow "approach + jump + spike" for the players. Why to Catch and Toss? When catching and tossing, it helps very beginning players to keep the ball up in the air longer. It also teaches players how to play volleyball correctly with three contacts. If playing regular volleyball, beginning volleyball players are likely to keep hitting the ball over with the first contact. They learn quickly that putting the ball to the other side as soon as possible gives often the best results, which is not good for learning. Volleyball offense starts with passing/serve receive – and follows with setting and attacking (also called spike). Passing, also called the serve receive follows the opponent’s serve. The purpose of it is to pass the ball to the setter, who is the playmaker of the team. Volleyball players usually pass the ball underhanded (bumping), but since the rule changes passing overhead (by setting) is also allowed. When passing the volleyball player takes the basic stance - shuffles into the correct spot - stops the movement - and places arm platform under the ball - and hits the ball with the minimal arm swing for the setter. When serve receiving there is no need to swing the ball with arms. The extra power for the bump - when bumping a free ball - should come from the legs and through the body, not solely swinging the ball heavily with arms. Player who specializes on serve receive/passing is called a libero or defensive specialist. Usually outside hitters and the right side hitter, who all are also called wing hitters, carry the passing/serve receive responsibility too. The letter is a player who contacts the ball after serve receive/pass. The purpose of a set is to direct the ball for the attacker. The setter chooses between multiple options, trying to give the team the best to score a point. Setter is like a quarterback in the football team or the point guard in basketball team. How to Set in Volleyball? Setting is usually done by overhead setting with fingers (hand setting), but sometimes setting has to be done also by bumping the ball by underhand pass for the attacker (bump setting). When setting the ball with fingers, the player places both hands above the forehead – index fingers and thumbs should form a triangle. Index fingers and thumbs should almost touch each other – they should be 1-2 inches away from each other. The player contacts the ball with fingers – without letting it touch on the bottom of the hands. 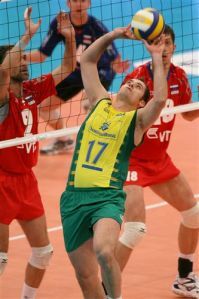 In the basic setting footwork, the setter first takes left-right step. The right foot being around half the foot in front of the left foot - legs slightly bend, so the setter is able to push with legs, especially when setting to longer distance. Then when contacting the ball, she pushes forward with legs, follows through with the left foot and shifts the weight forward. After the set, the left foot is front of the right foot because of the weight shift. The setter could try to repeat the rhytm: "left-right-push through it".. "left-right-push through it".. to help to memorize and to get hang of the setting. For people who are just learning how to play volleyball and want to learn the basic skills as quickly as possible, it is recommended not to spike the ball in the training sessions – since it diminishes longer rallies. To ensure longer rallies for the beginning volleyball players, it is recommended to “set” or “bump” the ball over the net. How to Play Volleyball - How to Learn Volleyball Spike? How to Spike In Volleyball? When the skills improve and rallies start being longer, players can start learning to spike by hitting the ball over the net - with both feet on the ground at first. Later on when the approach has been honed without the ball, players can attack by making an approach, jumping into the air - and first tipping the ball into the other side of the net. After timing has been learned, players can start spiking the ball over the net. Use your arms for a powerful arms swing to raise yourself into air. To get the feet and the arms work in-sync, it is extremely important to work on it without a ball for several training sessions. Pretty accurate tip for timing is to place either the first right foot or the left foot on the ground when the setter releases the ball. Naturally this depends on the speed of the set, but it is a good rule of thumb. Volleyball Offense - How to Attack? Other good rule of thumb is to place your left foot (when accelerating the speed) somewhere between the 10 foot (3 meter) line or 2 feet off the ten foot line. It is close enough, if you accelerate good speed, which is important for your vertical jump. The player who specializes mostly on hitting is called the opposite hitter. The opposite hitter plays the opposite position of the setter. Also right side hitter, left side hitter (outside hitters or wing hitters) and middle hitter (center, middle) has attacking duties in the volleyball team. 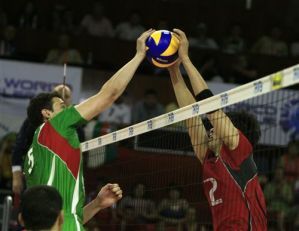 Volleyball block is an attempt to block the opponent’s attack. It is done by jumping up into air slightly after the attacker and pushing the hands over the net and reaching into the other side of the net towards attacker. Keep your eyes open when blocking! Do not close them! Only three front row players who play at the net are allowed to block. When the ball is in the plane of the net (when any part of the bal is above the net), both sides have the right to play the ball. (Seriously, this is correct! Even many referees don't get this right!!). One more time; when the ball crosses the net, even by a half-an-inch, both sides can play the ball. Digging is an act which is trying to prevent the ball falling into the court after the opponent’s attack. It can be done by digging underhanded(bump) or overhead (overhead dig with fingers). Volleyball Digging - How to Dig? Digging duties are mostly responsibility of three back row players. If the front row player doesn’t block, his duty is to help back court players in defense. The players have to trust each other to follow the team tactics. For example; if blockers trust the defensive player to dig the line shot by blocking the angle, the defensive player simply has to be on the line to dig the ball. Otherwise it leads to endless guess work. Next time the blocker may decide to block the line anyways, because the defender wasn't there the last time.. so follow the defensive strategy! Coverage is a defensive action in which players place themselves under the block – to save the ball back into play in case blocker blocks the hitter. The spiker may also make an intended swing to the block - and use the block to rebound the ball back to the own court side. The spiker needs teammates on the coverage to dig the ball for the setter.